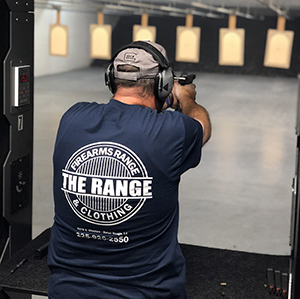 FRC Indoor Range is Louisiana's newest and most state of the art shooting range and professional firearms training facility. At FRC we provide our customers with the safest, cleanest, and most comfortable shooting environment available anywhere. Recently awarded the prestigious 5 Star Rating from the National Shooting Sports Foundation, FRC is the only range in the State to be so recognized. Our highly experienced and professional staff are among the friendliest and most knowledgable in the firearms industy. At FRC we take the safety of all of our shooters very seriously, and we are one of the very few ranges that maintains an RSO Station near the firing line at all times. Our Range Safety Officers are always on duty, and are fully commited to ensuring that your experience with us is always safe and enjoyable! FRC Range has seven 25 yard lanes, and shooters are welcome to fire pistols, rifles, or shotguns. The only restriction is that all rifle ammunition must be lead core, and shotguns are limited to 00 Buck, 000 Buck or Slugs. Unlike many ranges FRC allows qualified shooters to do holster work on the line with the approval of the Duty RSO. We look forward to seeing you at the range soon!